Here I’m picking up on a throwaway comment I made in a thread on Larry Moran’s “Sandwalk” blog. Larry wrote about protein turnover in the cell, a favourite topic of mine to start with, especially when proteasomes come into play, as they so often do. Ryan’s reasoning wasn’t bad. He argued that “dehydrating the proteasome would change it’s structure and probably eliminate any catalytic activity.” That makes sense, but it misses something unusual (though not unique) about the proteasome. Proteasomes have been in the news quite a bit since they won the Nobel in 20042 and there are lots of friendly introductions to proteasome-mediated protein degradation around. The Nobel Foundation has a fairly friendly “Information for the public” thing, and a less friendly but more complete PDF . For the purpose of peptide splicing, though, you only need to know the basics. Proteasomes are multicatalytic. That is, they can chop up many different peptide bonds. That’s in contrast to many proteases, that only cleave when a very precise sequence of amino acids line up. Proteasomes do have their preferences, sure; there are sequences they don’t like — but if you feed a protein to a purified proteasome you’ll find that virtually every possible amino acid pair has been cleaved (if only very rarely). If they’re multicatalytic, and they’re abundant, then they’re a potential hazard to normal cell function. You can’t have a protease indiscriminately chewing up cellular proteins. So proteasomes are regulated proteases (the regulation part is what the Nobel was for). If they’re regulated, you have to have a way to shield the catalytic sites so they only attack what they’re supposed to. Proteasomes do this by hiding their active sites on the inside of a hollow cylinder. Here I get to throw in a couple of images of the proteasome, which is something I do at every opportunity anyway.3 There’s an end view and a side view.4 In fact in a real cell, you probably wouldn’t see the end view like this, because this is the central core of a larger particle that has caps over the open ends. But it makes the point that this is a hollow, barrel-shaped structure. The catalytic sites are on the inside, the caps normally prevent access to the inside, and the regulatory machinery ends up selecting proteins that feed into the open chamber for destruction. A couple of other proteases follow this pattern, by the way — tricorn protease is a huge, hollow icosahedral particle, for example. Tripeptidyl peptidase II is also a gigantic particle, and I wonder if there’s some kind of regulatory aspect to its size, even though as far as I know from relatively crude evidence, the catalytic sites of TPPII are more or less exposed. 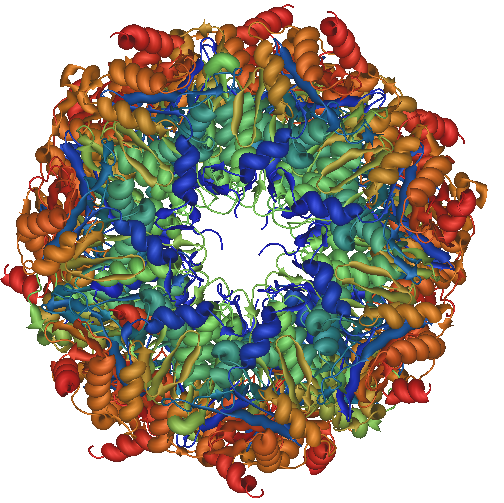 Anyway, the hollow barrel of a proteasome is probably the key to its ability to do peptide splicing. As daedalus2u pointed out, enzymes run both ways. Proteases in general act through hydrolysis, which requires, of course, water. If there’s no water, the reaction can run backwards. In the old days, I’m told, that was how you synthesized peptides: you took the appropriate enzyme and ran the reaction in a non-aqueous system. 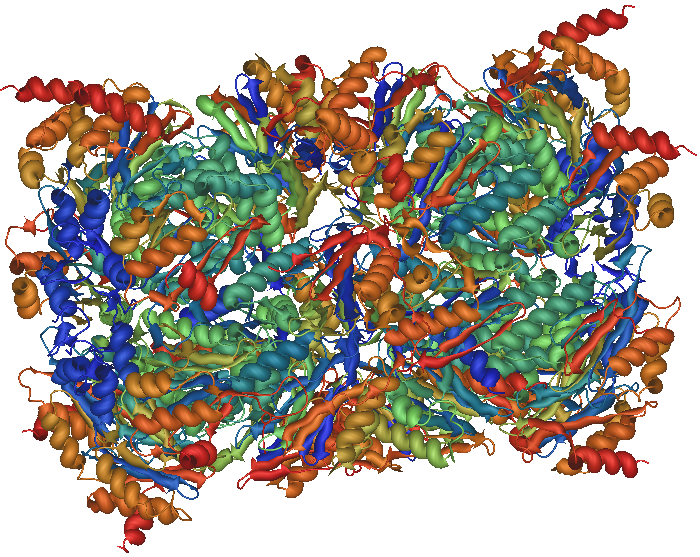 Normally, of course, there is water inside a proteasome, or it wouldn’t work. But it’s not hard to picture a scenario where peptides are being rapidly generated, and before they have a chance to diffuse out of the proteasome they’re squeezing away water molecules. There you have a high concentration of reactive peptide ends, crowded together in the absence of a water molecule and bumping up against a promiscuous active site. When that happens, you can get peptide splicing. How common is this? After the first paper or two, we really didn’t know. When you look at peptide epitopes associated with a cell, I’m told, there are often a significant number that can’t be identified by blasting through databases. Were all of these unidentified because they were peptide splices? That was Benoit’s original idea, I think, and I wouldn’t have been at all surprised to see a small flood of papers triumphantly identifying as spliced those pesky holdout peptides from previous work. Hasn’t happened, though. It’s negative evidence, but for the most part peptide splicing doesn’t seem to have fixed the problem of the unidentified peptide.7 Perhaps there will still be a herd of peptide splicing examples popping up any day now, but for now I’m leaning to the idea that this really is a very rare event. Too bad, because it’s pretty cool. This entry is filed under Antigen processing, Science, Ubiquitin-proteasome. You can follow any responses to this entry through the RSS 2.0 feed. Both comments and pings are currently closed. I don’t think it is correct to speak of a ‘reversed reaction’ in this context. I find it really hard to imagine that the proteasome (or any other protease) would be able to join a free peptide N-terminus to a free C-terminus. What I consider much more likely is a mechanistic transpeptidation. During a normal hydrolysis of a peptide bond, proteases form covalent intermediates with the substrate, which are subsequently hydrolyzed by water, thus restoring the enzyme active site and liberating the cleavage products. It is conceivable that under certain conditions, hydrolysis by water can be replaced by ‘aminolysis’ performed by a primary amino group (like e.g. the N-terminus of a peptide). This reaction is still related to a hydrolysis and can hardly be called ‘acting in reverse’. Well, at the end of the day, the result is the opposite — you join together two peptides and make one, instead of breaking one peptide into two. In that very general, functional sense, the reaction is going in reverse. At the molecular level, sure, it’s very unlikely that it’s literally a reverse reaction. The resulting peptide “ABCuvxy” looks like it has been assembled from two short peptides, but isn’t. Maybe I am completely wrong, but this mechanism would be something I can live with, while a true joining of ends would be too much of a broken dogma.